Prevents infiltration to company smartphones and tablets via Bluetooth or Wi-Fi. Protects all applications, files and memory cards from prying eyes. Track the phone in case it goes missing. Lock it remotely to prevent unauthorized access to company data and servers. Opt to delete all contacts, messages and data on removable memory cards. ESET Unilicense is a unique licensing system which allows you to deploy ESET security solutions on an operating system of your choice across the company network. Check the security status of your smartphone fleet, run on-demand scans, push security policies and set uninstall password. Get overview of the platforms, OS versions and other information and stay up-to-date on your smartphones’ security. Suitable for all Android-based devices including Smartphones, Tablets, Readers, etc. Version for Windows Mobile and Symbian also available. Filter out unwanted SMS/MMS messages. Define custom blacklists/whitelists or simply block all unknown numbers. 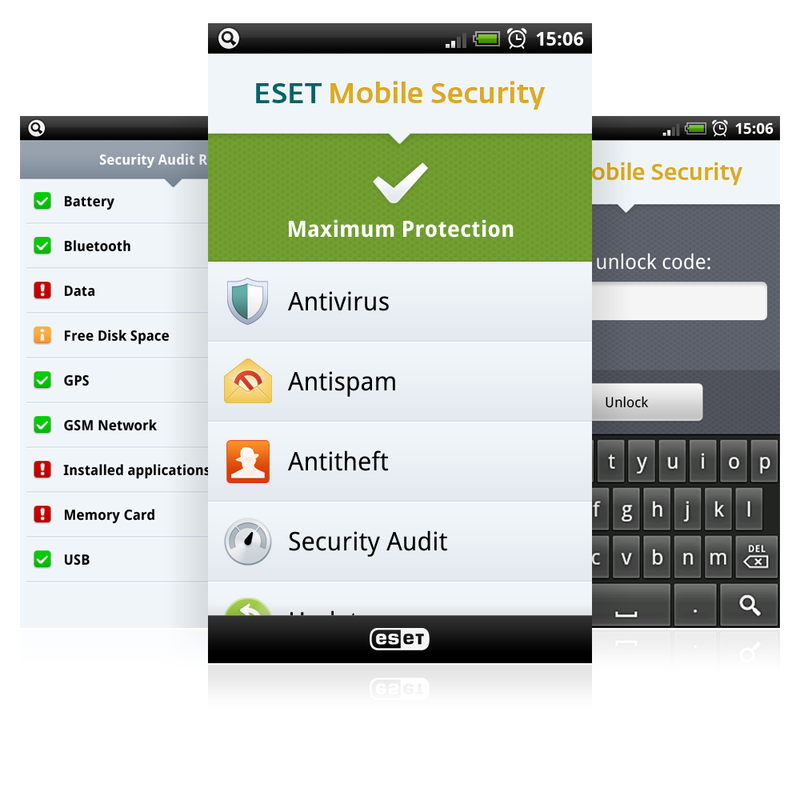 Protect all applications, files and memory cards with the ESET NOD32 proactive technology optimized for mobile platforms. An on-demand security audit checks the status of all vital phone functions, including battery level, Bluetooth status, home network, disk space and running processes. Advanced scanning protects company smartphones and tablets from threats attempting to access the system via Bluetooth or Wi-Fi. On-demand Scanning provides reliable scanning and cleaning of integrated memory and exchangeable media. Scanning of specific folders is also supported. Allows administrator to push a message to the device with custom text via ESET Remote Administrator. The message priority can be set to normal, warning or critical warning. Lock lost or stolen devices by a remote SMS command. After locking, no unauthorized person will be able to access data stored on the device. Safely delete all contacts, messages and data on removable memory cards. Advanced cleaning procedures ensure that it is not possible to restore wiped data (Android 2.2 and higher). Remotely locate the phone using a remote SMS command and track the phone’s GPS coordinates. Stay in control of your company smartphones remotely, even when an unauthorized SIM card is inserted. The Admin Contacts’ phone number will receive a wealth of information about the inserted SIM, including the phone number, IMSI and IMEI codes. Set up one or more Admin Contacts for your company mobile fleet to receive all the important information in the event of a loss or theft. One password controls it all. Only authorized persons will be able to uninstall ESET Endpoint Security for Android (version 2.2 and higher).